Music, opinions, news and people of all genres come together for Palermo’s radio station in Buenos Aires, Argentina. From Blondie to Italian opera, and reggae to talk radio, the Palermo barrrio and surrounding areas enjoy new musical madness every day. Local and foreign contributors record and share their inspirations to whoever is tuned in to 94.7 and 93.9 FM. http://www.radiopalermo.com.ar/ Programs, jingles, publicity, promos, you name it, these guys do it. The folks behind the station’s innovations work to entertain teach and inform locals with music and knowledge. In a world where all journalists fight for the “dying field,” RadioPalermo gives new hope to all radio broadcast stations. RadioPalermo’s station is specially designed to offer services to all creative minds willing to walk through the front door. “Independent producers” are able to develop their programs in comfortable environments, promoting the optimum place to work. RadioPalermo is a more than just a radio station; it is a center of learning. One can take workshops and participate in training seminars in expression, conduction, technical operation and production. Students, producers, advertisers, listeners and artists are given the chance to participate in their own unique radio programs. Together, they work to transform radio and broadcast journalism. The station offers many levels at which one can experience this magic. “Self study” opportunities allow anyone to put on their own show and actually operate the technical aspects of the show. Self studying programs are equipped with top-of-the-line sound processing systems and technology. Students and artists are given the chance to learn, perform and create live radio. 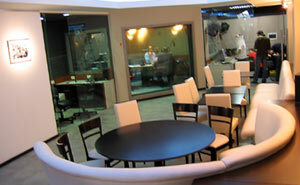 Studio audience rooms at the station allow radio hosts to share space with up to 15 people in their broadcast studios. The station also offer studies in the production of sound, where one can record and edit creative ideas and music in a live production. And of course, the station has its own bar, Radiobar-Reduced. 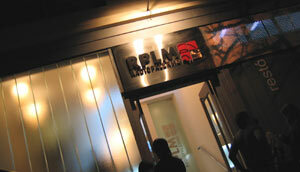 The Radiobar and restaurant are open to the public, offering a view of the studios and the rooms of technical control. Whether it is the musical talents, the in house bar, freedom of speech or production studies, PalermoRadio gives all radio stations a run for their money. La Copa Mundial Está Todo en Argentina.